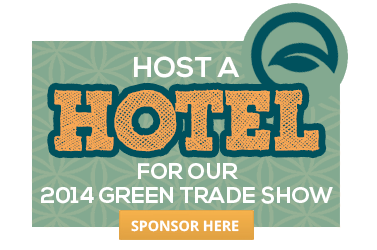 Green Trade Show 2014 - Austin Hotel & Lodging Assoc. Hosted by AH&LA’s Green Committee. This year’s location will be at Hilton Downtown! On September 3rd, AHLA will host the 6th Annual Green Trade Show. Please consider this personal invitation from AHLA and co-hosts BOMA and GARA associations to attend this event and gain information on either going green, getting greener and to become informed of new Austin ordinances which are impacting your business. This green movement is now an integral part of our businesses and this show provides a one-stop shop for answers. Those urged to attend are directors of Engineering, Chief Engineers, Housekeeping, Food & Beverage, Room Division Managers, General Mangers and our valuable industry suppliers and members of all 3 associations. Tradeshow: 1:30 – 4:30 p.m. Cocktail reception: 4:00 – 6:00 p.m.
To create awareness in the Greater Austin Community of Green Initiatives that the hotel industry undertakes, how we are moving forward in decreasing our Carbon Footprint and to contribute to the enhancement of viable ‘Green Initiatives’ locally.